Here is Petra's Gel Stuff. Some unknown squishy substance that is used to reduce pump vibration and thus reduce noise. And the question is does it work? And the short answer is yes it does. Did I mention it is squishy? Do not eat... So when you aren't playing with Petra's Gel Stuff, or wondering what heck is this thing made of? You may want to put it under your pumps, and then clamp them down to apply a small amount of pressure. The pump then sits on the Gel Stuff like a cradle as it forms itself around the pump. So motion and kinetic energy from the pump is dispersed through a large surface area. And since the Gel Stuff, is tangible, or in lame sense terms squishy, the vibration tends to echo less. This is specially important in Aluminum cases, that are more prone to noise from pump vibrations. So basically as the name implies, it some sort of gel, and reduces noise and works wonders. 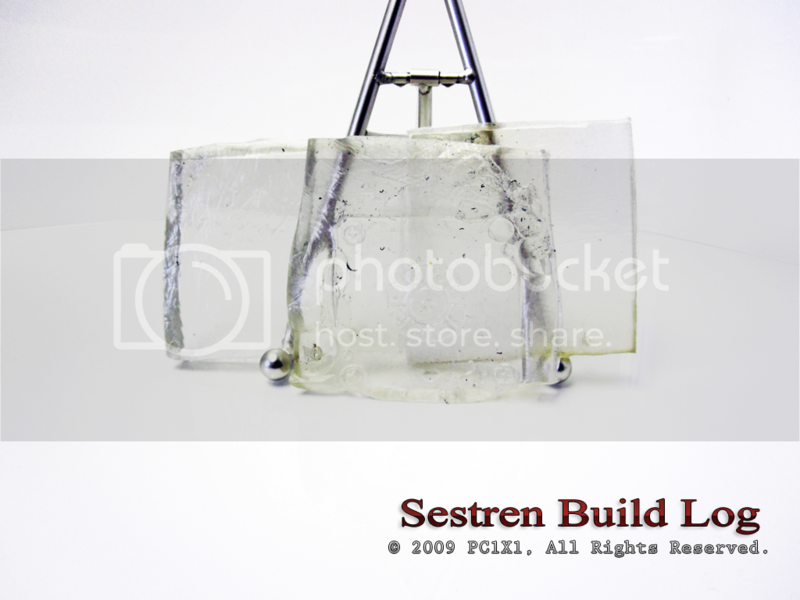 Sestren, is very large, so very prone to pump echoes, and the gel stuff takes care of that better than the standard sponge that came with the pumps. Gel stuff is inexpensive and easy to apply, so if your having some pump noise due to vibration (not pump whine) then definitely be sure to check out the Gel Stuff. Due note though, that the Gel stuff does turn greenish, and seems to be prone to breaking apart easily, so do not be surprised to change your Gel Stuff after a few uses in your water cooling system. There is a low light picture above deliberately showing the wear and tear of a lightly used Gel Stuff. Aside from turning green, it works great, and is highly recommended. Now just to figure out what this stuff is made from? Also did I mention Do not eat it! 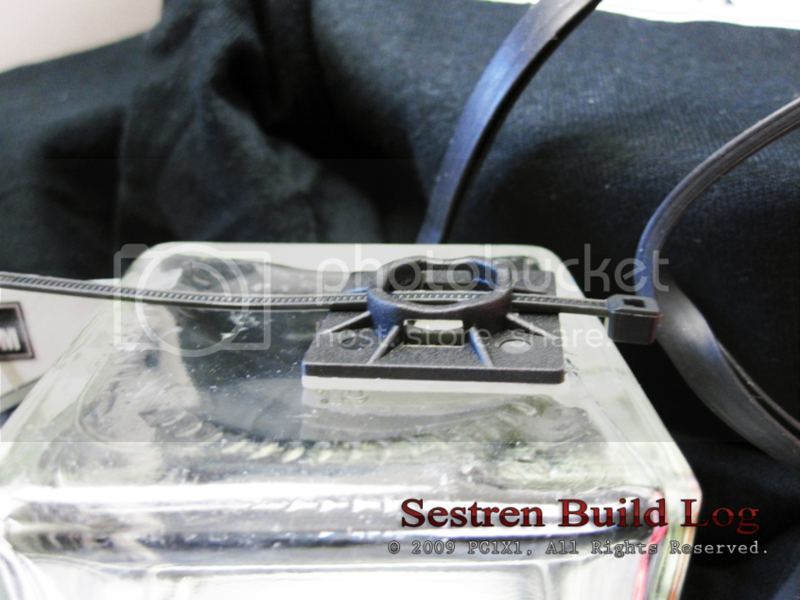 Today's specimen is Wire Management clips or the building blocks of any organized and routed case. Aside from the original, aka. Zip ties, Wire management clips are your best friends, in routing your cables. By routing your cables, you are making you computer more aesthetically pleasing, increasing its airflow be decreasing the surface area of wires that can impede airflow. These are very small clips that can route wires around. They are strong and well built and feature a very strong adhesive base. Unless forcefully pulled, they will remain in place. A lesson learned when I stripped Sestren again for painting at the painful cost of 30 clips. Generally one would want to put the clips in angles that they are not seen, to give that illusion of no wires. Since these particular clips are small they are by far the best for routing 3 Pin Fan cables. 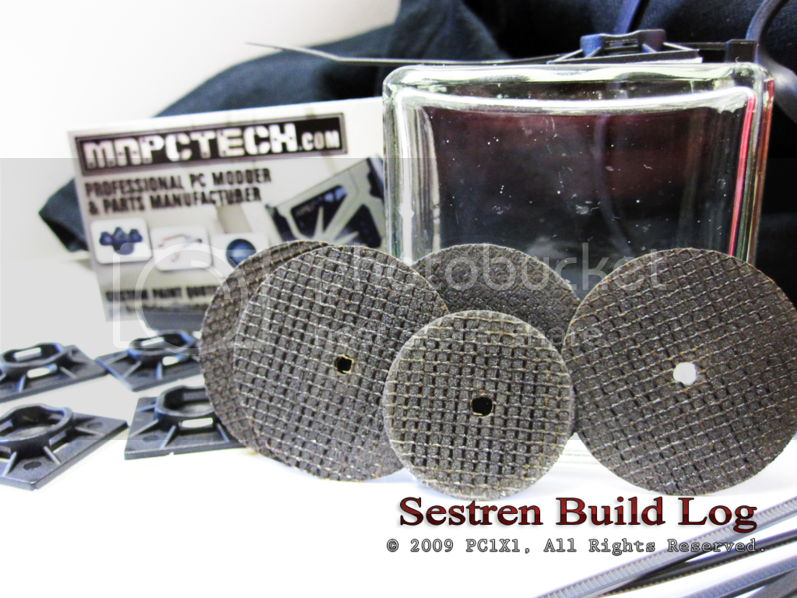 I use them alot through Sestren, and they can be used for various applications. Pro Tip: Put one with the hook face up, and then the next one with the hook face down, and you have just created a physical lock for the wiring! So be sure to experiment with all the combinations. Personally I would recommend a mix between various Wire Management Clips, being these are the smallest and thus most versatile ones, a few bigger ones, and some usesage of Zip Ties. And you too can achieve that clean wiring look. While cable routing is tedious and mostly a painfully frustrating process, the end result is clear. It makes it easier to management and upgrade your components. Makes your computer more pleasing, and gives you that satisfaction of OCD organization. I have searched high and low for the best clips, I mean I have 30+ fans, Pumps, and 500 ft of sleeved wiring in there! And these were the only inexpensive ones I could find at this size. The glue sticks well, a little to well! Pro Tip #2: Use Goo Gone to remove the residue! And you have yourself the best foundation for an organized and clean build. Also feel free to color them, I will be painting them Black soon! Ever wanted to look stylish while modding? I mean you pay popular companies to wear and advertise their logos in your clothing! So while not pay for the hobby you love?! 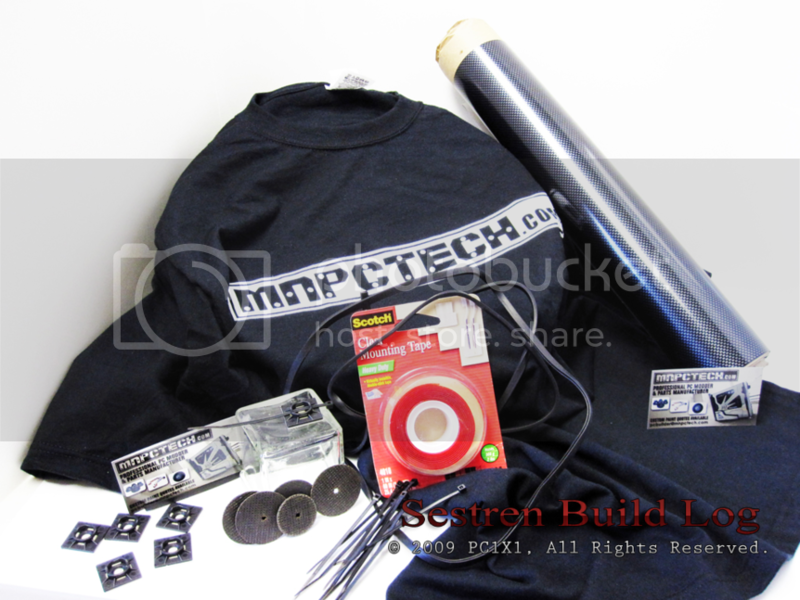 Enter the MNPCTech T-Shirt. The only T-Shirt that add Megahertz to your overclock. *Note: This claim is not verified by any credible source, and should not be taken seriously.... or should it? The shirt is standard Fruit of the Loom, silk screened t-shirt, and most likely will shrink a little after a wash. However it is very well done. The front sports the MNPCTech logo, while the back has a awesome cut out of a computer case being modded. More pictures of the back of the T-Shirt in the next installment. So whenever your feeling fly, and or need to be inspired by modding. Check out this great T-Shirt. It feels good, as its a standard good old Fruit of the Loom T-Shirt, but most importantly finally advertises something you love. So you can be different from everyone else, and become alienated in your own hobby. Also makes great PJ's. I may or may not pick up girls, not enough testing has been done on that segment yet. More research required. 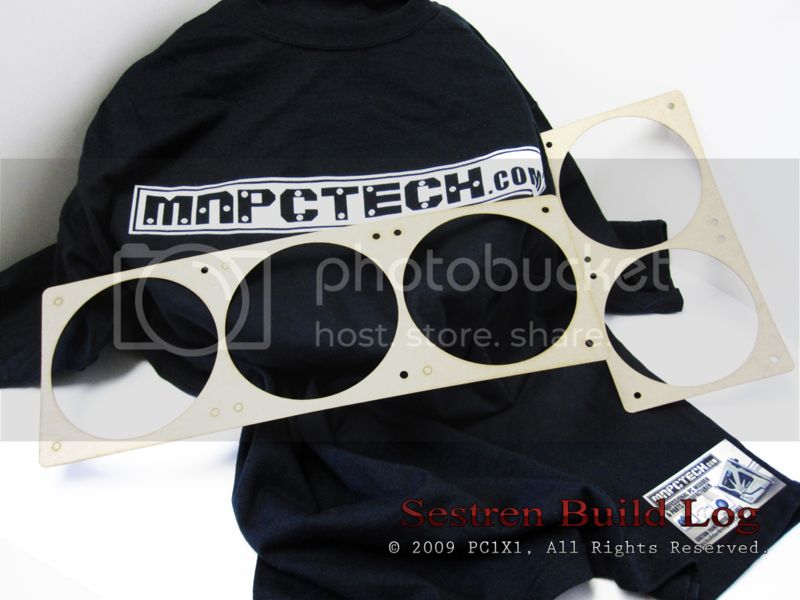 Aside from the styling shirt, we have here radiator grill cut outs that can be used from testing fitting certain non existing custom grills for a certain build log. To actual modding of your case. 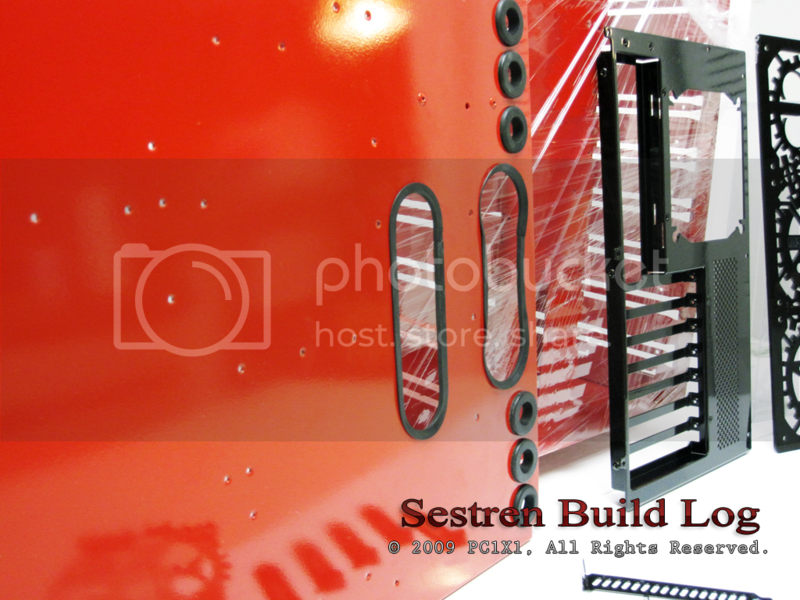 Do you want to add holes to add a internal radiator to your case? Well look no further, as these are perfectly cut to simulatate actual Radiator size. So one can add a grill and or radiator with ease. Simply press these guys down and draw with the pencil an outline, or if you have the disposable income, buy several and simply use them as stencils for your projects. Either way they are great helpers to any modding project involving radiators. Highly recommend, and I would pick up a few, as their only drawback is that they are flimly, and easily belt, stepped on, or eaten by your family pet. So what happens when the mod your are building, has wheels, pseudo carbon fiber, is water cooled, has radiators, needs heat disapation, and has the capacity for 2000 kilowatts? And is not a car? Well then you have Sestren, or specifically a mod. And to actually implement these mods, I need my good old trusty tool box. Here's a short review of some items I will be using on Sestren. 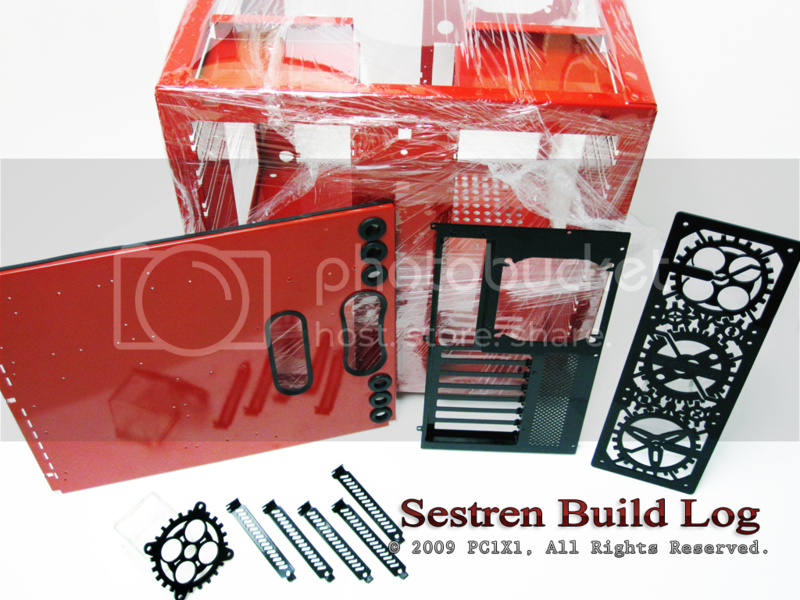 Since alot of these items are fit and finish trim pieces, obviously I cannot use them in their practical purpose, however I can provide a first hand review, on their form and functions, and I will expand this later when Sestren is in the Fit and Finish phase. First we have the Zip Ties, like the previous review on Wire Management Clips, Zips Ties provide the foundation or basis for your wiring. These Zip Ties are standard fair, strong, durable, easy to use, and come with very good adhesive bases, as you can see in the picture. These are perfect for large wires, that will not fit in a management clip, i.e. 24 Pin ATX Power Supply Cable. However the most astonish fact on these MNPCTech zip ties? The kit is extremely cheap, cheapest place I found for these particular ties by a long shot. They are very dense black, and attractive, while the base has a nice contour. Plastic is problably ABS plastic, but is sturdy. Overall when used properly they are your best wiring friends. 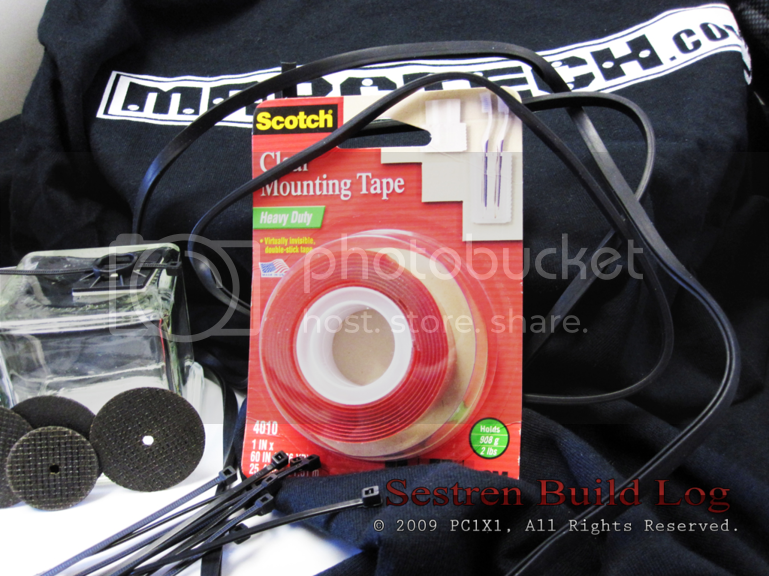 Next up we have Mounting Tape, this is a Scotch brand, which you can also pick up inexpensively at MNPCTech. I tried to find a comparison in Home Depot/Lowes, but was unable to find one. Obviously this package is still shrink wrapped, so I have not put it in practical use, however 3M is basically the industry standard on adhesives, they invented quite a few of them. So I wouldn't expect any less than a great product. So for practical purposes, I turn to MNPCTech's own website owner, Bill Owen who claims this is the "Tape from the Gods". And since Bill Owen, is a pro modder, and owner of MNPCTech, I take his word very seriously. 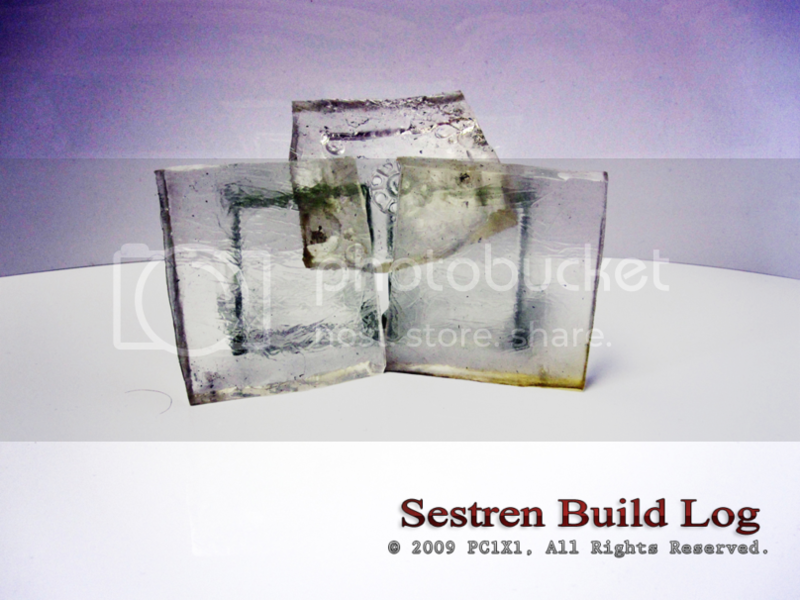 You can also check out a video on how to make a floating window, that gave me lots of ideas on doing a few things for Sestren. The tape can also be used to apply Wiring Management Clips, that have had their backtape ripped out. Anyhow 3M makes good stuff, couldn't find an alternative for comparison, and the price is pretty good. So if you need to mount something I would take a look at this tape. I will post more impressions when I am using it in Sestren at a later date. Which leads us to Dremel Discs, or another Modder's foundation tool; the dremel. Since computer cases hold micro..etc components, cases aren't very big at all. Although Sestren would disagree with the norm, computer cases are generally small. So you need a small and precise tool. For cutting thin steel and aluminum, one would be hard pressed to find a better tool like a dremel. However just as you need the dremel to make the cut, the dremel needs its own accessory to actually implement the cut. And here is the Dremel Discs. These Discs are specifically made of Aluminium Oxide, and thus are more resistant and don't heat up. The best part, they are made specifically to cut metal, so with the right tools, anyone can do the job. It does take alot of patience and safety precautions, as one should always wear safety googles, work in a well lighted, and ventilated area, and read all pertaining manuals. You may be asking? Ok so its a circular disc, so what? It is a circular disc, but it is without a doubt the best disc I have used to cut aluminium with. The sweet spot I found is 25,000 or higher RPM on your dremel, and light touching the surface. Don't force your way as you will wear out the discs faster. However the best quality I found on this disc, is the fact it did not heat up or warp my Aluminum chassis. As you can imagine, I am cutting through the motherboard frame, completely anxious, because if I screw it up, I can't buy one at a store, as I modded the plate to be removable. I would basically have to buy another Lian Li 343B, so I was extremely happy, that the discs not only worked, but made my job easer, and clean. This was my first time using a dremel, and it was pretty simple, be sure to check out MNPCTech's videos on how to use a dremel as they were great intros on what I was getting into. My only complaint with the discs is that they wear out fast, however it could have been due to my inexperience. I did talk to Bill Owen, on tips and why the discs wore out so fast as its became almost half size from only one mod, (the smaller one in the pictures is the one used). And Bill basically told me, I applied to much pressure, and I don't doubt him, as I originally out of fear, started out at 5,000 RPM, and kept moving up. As I gained confidence on the discs, and noticed they were working exactly like they should, I upped, until I found 25,000+ rpm to be the best. Overall great discs and got the job done, you will be able to see the results from the mod, when the cube comes back from powder coating. Also save your smaller and used up dremel discs for more delicate cuts, so even used they can still be reused for greater value! So after cutting the motherboard tray, I wondered what could I use to make this finish more profesional, I had already sanded it down. And again MNPCTech had the answer, C-Molding. Or U Molding as they call it, but I call it C Molding. Pro Tip: If it bothers you that I call it C-Molding, while reading this tilt your head to the right and its now a U. So while my cuts onto the motherboard tray for routing are currently secret, the molding is not. I put it on there to test, and it worked perfectly. Its made of a good feeling plastic, i.e. doesn't feel uber cheap, and is very dense black colored. Overall it will fit with the theme and augment the finish on Sestren. It is great molding, and you will see the results when the cube is painted. If you need to make any dremel cuts and want to avoid cuts from where you modded with your dremel or other tools that leave the area a little sharp. C-Molding is the tool for the job. So I have my mod done, everything is ready, I am building almost a car, I figured, what's left to get? Enter Carbon Fiber Film. This pseudo Carbon Fiber appplique can be used to augment your computers aesthetic looks. Because honestly, almost no one has real carbon fiber in their car, let alone their computer. And since our computers aren't going anywhere, at least not normally aside from Lan Parties, weight does not matter to much. At least not in small components, so real expensive carbon fiber would be of little to no use. However let's be honest, it still looks cool, and expensive. And adding lights to a computer is just aesthetics, so why not add some carbon fiber trim for that F1 look? 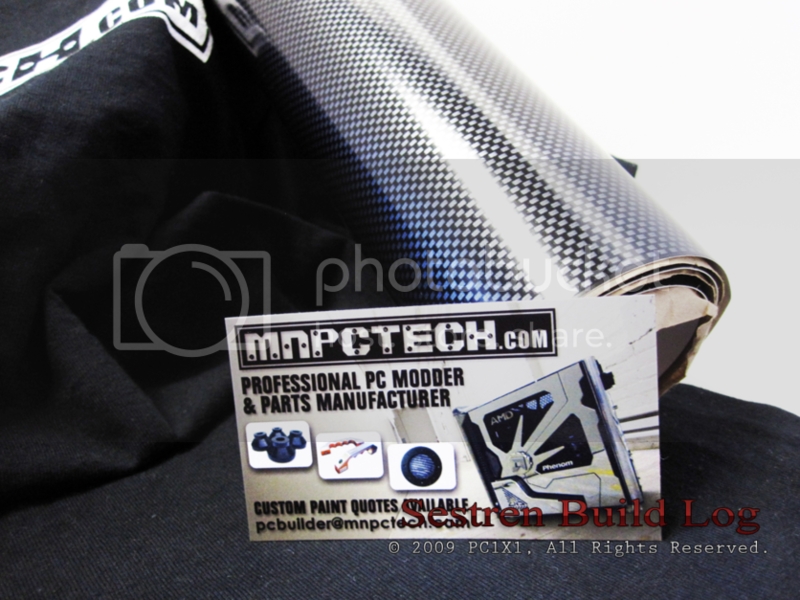 The Carbon Fiber film looks great, infact its very close to real carbon fiber. So while using it alot may make people think your are "ricing" your computer, the same can be said for LEDs. So use it sparringly, and it can definitely give your computer a unique look. Its made of very high quality film, is again pretty affordable, and best of all, doesn't leave any gunk while applying it or removing it. So you can use it on your mouse, keyboard, or inside your computer. 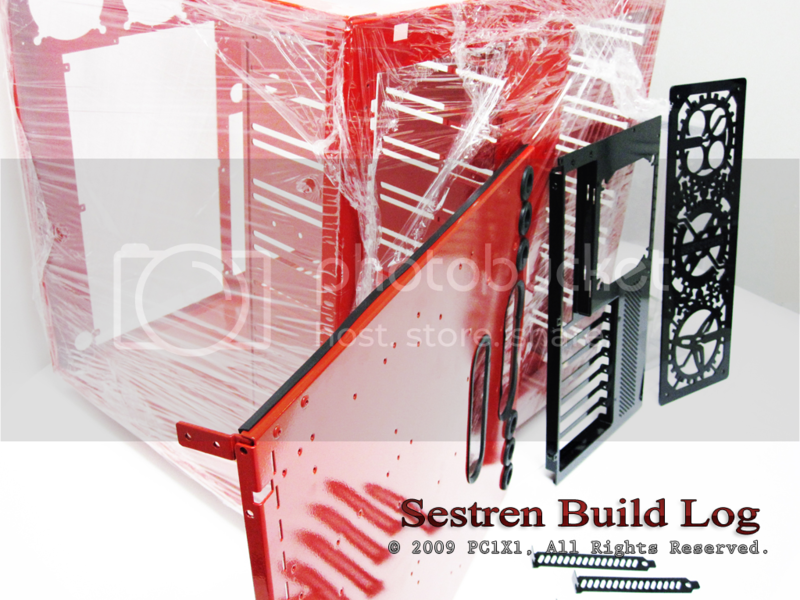 The possibilities are endless, and since Lian Li gave Sestren some pseudo carbon fiber on its top front, I will accent the insides sparingly and tastefully with it, stay tuned to see it in actual application! Hopefully these reviews gave you guys some insight on what I choose what I choose, and what I learned while building this computer. Be sure to ask any questions, and most of all, go out there and build your own worklog! Thanks for reading! No seriously it was pretty long! Until next time, stay tuned as actual parts are coming in through the magic that is MAIL! Talk to you later! Be sure to support great passionate stores, like Petra's Tech Shop and MNPCTech, they aren't gigantic major corporations, but enthusiasts like me and you, that share the same passion for computing. Give them a call, mention this worklog, mention your love for computing, as both Alex, Quoc, at Petra's, and Bill Owen at MNPCTech were super nice enough with me, in both making sure I got my orders right, and answering any questions about my project in their respective fields, and hence I want to repay their favors. Major thanks and kudos to them both, and its the sole reason I choose to work with them for Sestren, it's their customer service, and attention to our community. Status: Are you ready to rumble? Brief: Some grills are arriving today, with more to come a bit later, so yes I can confirm at this point. Due to popular demand, I changed the reactor grills, heh. So we'll have some pictures of those and a review soon. Aside from that I am just waiting for confirmation to pick up the cube. I should be picking it up Tuesday, so expect an update on the build log, with actual work on the cube, Wednesdays or Thursday. I'll work on condensing the reviews for next time. Thanks and check back soon to see the red cube, we are almost there, I can confirm its painted! Talk to you later! Status: The Red One Arrives! Brief: Good Evening everyone, after much anticipation, Sestren has returned home. I would like to first off, thank Patrick from Fusion Powder Coating for an absolutely fantastic job on the 343B. The Powder Coat came out great, and exactly how I wanted. It is now red hot with passion! I would like to again thank my sponsors, and you guys for the feedback on the reviews. Any and all feedback I listen to, and correct anything that you guys mention. As you can see how the updates are shaping up. Its thanks to the awesome feedback I receive and keep it coming! On to business, Sestren has finally returned home, so it means it's time to boogie. Expect many updates, as I am assembling it, so many "Worklog" Updates to come! Overall I am very satisfied with the outcome of the powder coat, its great to see a vision start to take shape. It wasn't without incident however, as if you recall originally it was supposed to be a metallic red. However after speaking with Patrick, the owner and the one who powdered the cube personally. He advised me to withhold on the metallic, because due to the cooling properties and how thin the Lian Li Aluminum is, there was a chance that it may not come out even. So of course I took his professional advice, and I am glad I did, as it came out awesome none-less. Looking at it, I wouldn't have it any other way. I am a big fan of a certain red F1 racing team, so I am sure you can see a little bit of the influence there, heh! So theres definitely some "Passione" in there. So stay tuned for some tasteful carbon fiber touches here and there. The cube is currently wrapped as its not ready to be worked on for now, I shall be working on it this weekend, so thats October 9th, 10th, and an update should follow a little bit afterwards. 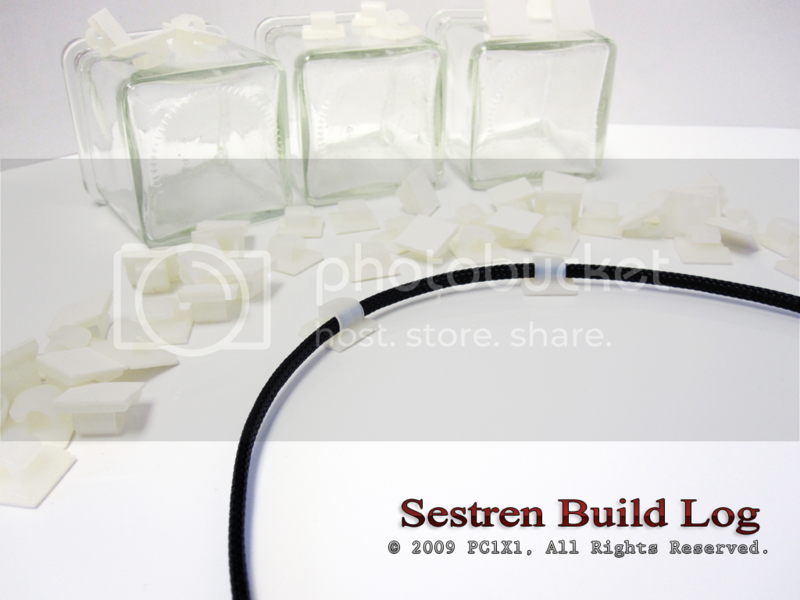 I am still securing some parts for Sestren, and depending on how some things go, it should be complete, around Q4 of this year, and or Q1 of next year. I am still waiting for some graphic card releases, as well as other parts that are coming. None-less I will still be working on whatever I can, so there will not be any droughts on updates, I expect to be pretty consistent, I have a schedule laid out. Overall I am pretty invigorated to work on it, as any who see a dream becoming reality would be. I hope to continuing to strive and bettering myself with each update. And I welcome you to join me in this pursuit. Thanks alot everyone, every time I see that little views counter go up, there's a smile in my face. Here's some of the parts featured on the reviews and where you can buy them. Especially check out these awesome Grills from MNPCTech. The pictures speak for themselves. Be sure to check out the first page for a complete part's list! And here's are the Stars from this update! The MNPCTech Accessories! 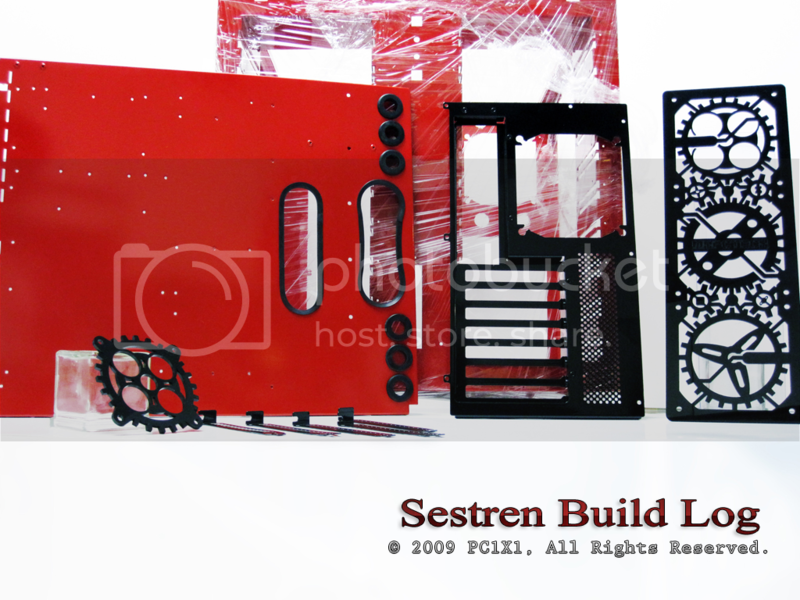 Description: Sestren has returned, in this picture you can see 80mm Black Gears grill, the modded removable motherboard tray, the vented PCI case slots powder coated black, the back plate of the 343B also powder coated black, the 343B chassis, and lastly MNPCTech's 360mm Steampunk Grill also in black. Description: Here is an aerial view of the previous picture. 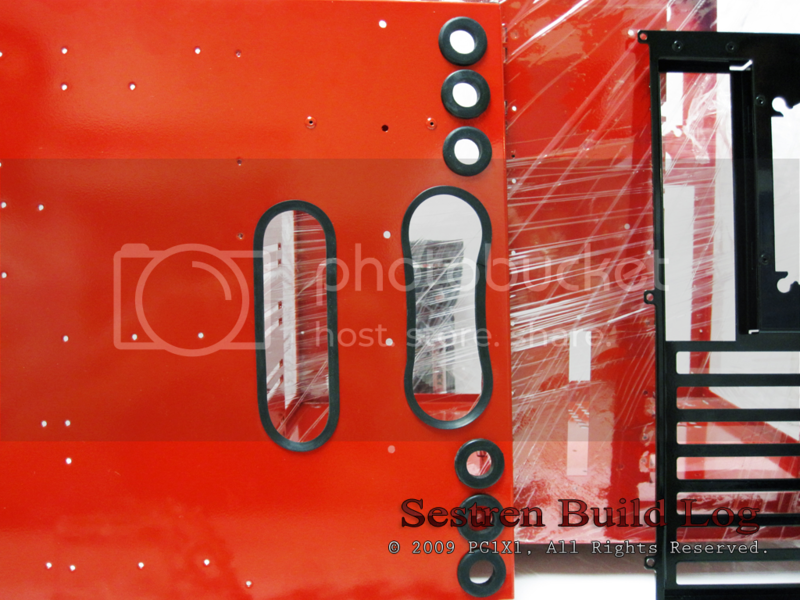 Notice how glossy the red powder coat came out. One can see their own reflection. It is also very natural and smooth throughout. Great job from Fusion Powder Coating indeed. I will remove the plastic wrap from the actual chassis as soon as I am ready to work on it, so no worries. It will have its own feature. 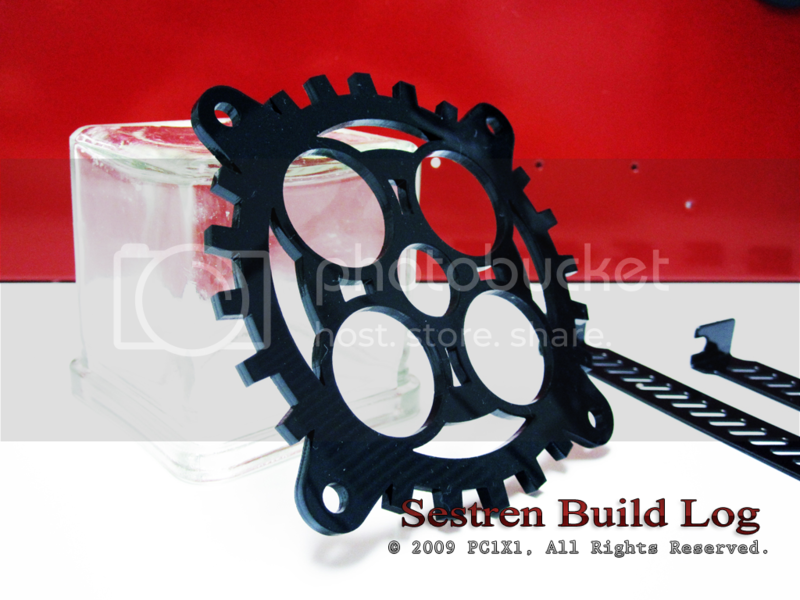 Description: Here's an up close shot of the 80mm Black Gears Grill. Notice how well made the cuts are. I was throughly impressed with the quality. At first I was hesitant since its acrylic, but its fit and finish are the best I have seen. Expect a full part's review at a later date. 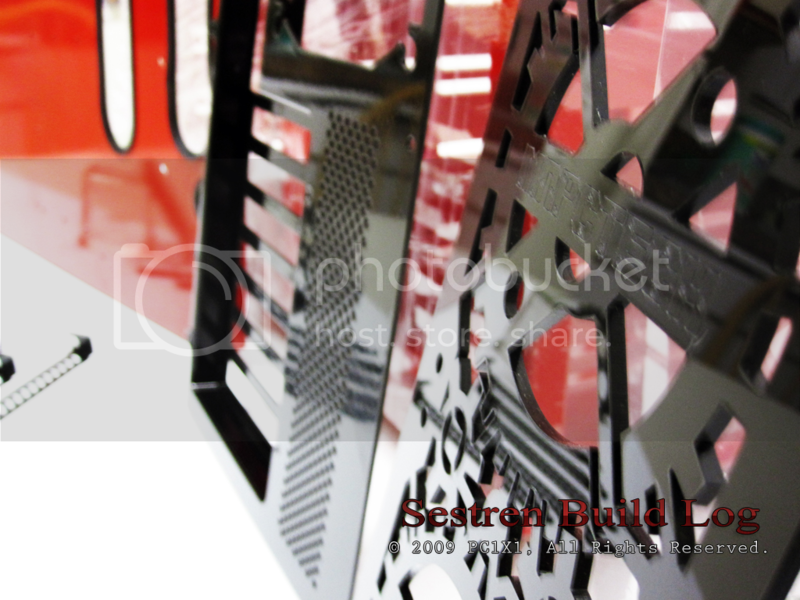 Description: An upclose shot of the 360mm Steampunk Grill, notice how it reflects and matches the powder coated back plate. The details are amazing, right down to the MNPCTech logo, everything is very well made. Expect this part's review along with the other grills. Description: Here's a front shot of everything, and you can see the mods I did to the motherboard plate. First it wasn't removable, but since it was a nightmare to actually tighten things inside the Chassis, I decided to make it removable, by removing the rivets, and tapping, so it self holds itself with bolts. Expect a more throughly detailed explanation later. Also notice the contemporary designs on the right side of the motherboard plate. I did that consciously, as I was expecting the gear grills to arrive, and wanted something to match their designs. The openings will be used to route PSU ATX cables throughout the chassis, and the smaller holes are for all the 3 Pin fan cables. Notice how well the C Molding blended with the design. Description: Here's a side shot of the action, where you can see the reflections of the powder coating again. Also notice on the top side of the motherboard tray. There is more C Molding. This is crucial and a part that is largely ignored, that cuts alot of builders. While the Lian Li case is already wonderfully build, and thus seldom hurts me, the C molding is a great looking finish, that not only is functional, it is pretty. Description: Here's an upclose shot, so one can see the details. Again C Molding does a great job as a functional finish. And if you look to the right most motherboard tray opening, you can see that the opening undulates almost like a figure eight. This was intentional, as quite honestly I thought it looked cool and contemporary. It was quite a bit of dremel work, and I couldn't have done it without MNPCTech's Dremel Discs. See my review for more info. Description: Here's a side shot of the action, notice how glossy that black is. It almost drags you in. 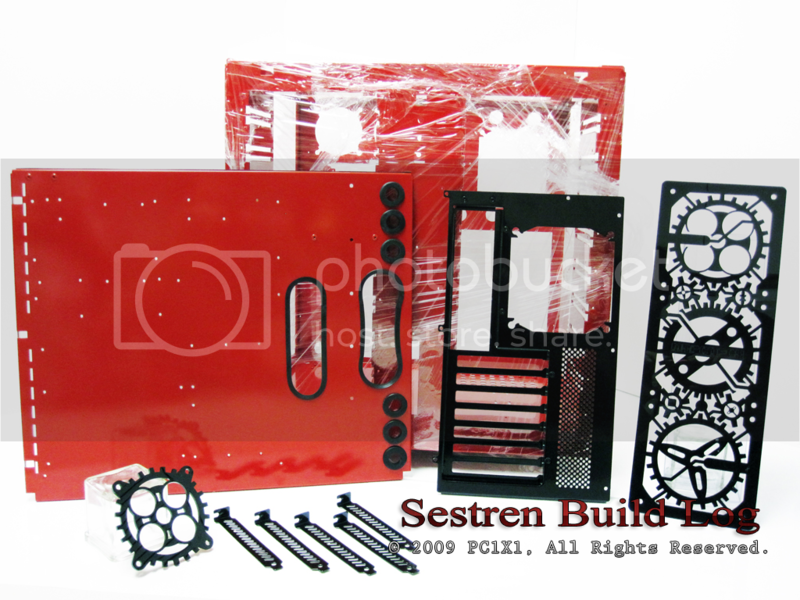 Couple that to contrast the passionate red, and you can start seeing the aesthetics of the build. Once its fully assembled, there is extensive use of color balance, and areas to draw your eyes in. I can't wait to put in the motherboard and the other equipment. I am very satisfied with how this came out. So stay tuned for more! Brief: I have not disappeared, there will be many more updates soon, however I must take a detour. I have been working on my temporary computer solution named Tower. Sestren controls the world through Towers in the Panzer Dragoon Universe. Anyhow I'll update around this weekend. Its been a learning experience because I have recently switched to Windows 7, so currently working on that. This is also a prep for Sestren itself, since it will run off the same OS. I am also designing the Hex Monitor stand, wish me luck, and I'll be back soon! Thanks and you too, I voted for you on Bit Tech! It definitely helps, but most of the burden will be on your shoulders, because you are responsible for the build log not just for yourself, but for others. So its great, but its not easy per say either.